Built by Short brothers, the Stirling was a four engined bomber in use at the start of World War II. 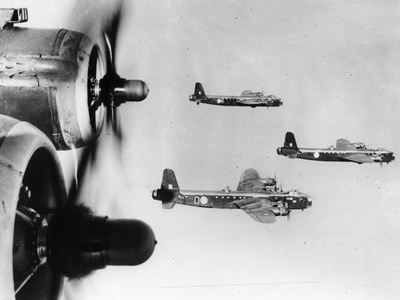 It had a relatively short service life as a bomber, from 1941 to 1943. Built by Short brothers, the Stirling was a four engined bomber in use at the start of World War II. It had a relatively short service life as a bomber, from 1941 to 1943 when it was replaced by the Halifax and Lancaster. It was then used to spread chaff, mines and decoys. When built it had better payload and range than anything else flying, but some structural issues such as a divided bomb bay meant that it lacked the versatility to adapt to changing requirements. No Short Stirlings survive. Designed in 1936 and built to spec in 1939, the Stirling flew its first sortie in 1941. The first four-engined bomber of the second world war, the Short Stirling was originally credited with a two thousand mile range carrying eight tons of bombs. However performance issues and heavy losses plagued the aircraft, which was withdrawn from service when alternatives such as the Lancaster were developed. An unarmed transport version outlasted the bombers, but was similarly withdrawn once better alternatives were developed. The heavy losses suffered by its crews during the early years of the war are something not to be forgotten in any study of aviation during this period. Total Short Stirling production was 2374 aircraft, spread across all variants. Given that so little about the Stirling survives, these figures may be inaccurate, although I have crosschecked several sources. Youtube user Bomberguy has uploaded this footage of a Short Stirling bombing raid over the Renault factory in 1940. The lack of information on the Stirling means that several sources quote different sizes for the aircraft (possibly because of modifications made for its later role as a glider tug). The figures above are an aggregate of several sources. The Short Stirling pilot's manual is available in PDF format on CD. More resources about this bomber are being sought by the Stirling project - see below. While it may seem strange to have a manual for an aircraft that does not exist, it makes interesting reading compared to the later Lancaster and Halifax manuals. Two pilots were awarded the Victoria Cross for missions undertaken while flying the Stirling. Both awards were posthumous. 1943 - Flight Sergeant AL Aaron DFM - severely injured after a nightfighter attack, he assisted the bomber aimer in making a wheels up landing so his crew survived, but died of his injuries. There are no surviving Stirlings. None flying, none in museums, no cockpit sections. Partly this was due to the time it was created - any crashed aircraft were promotly recycled to manufacture new ones. Because focus shifted so much to the later bombers - the Lancaster among others, the Stirling was overlooked and its notes and paperwork lost. Parts have resurfaced at crash sites. 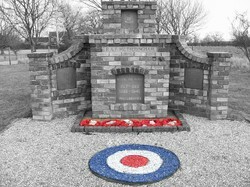 In Holland the engine of the Stirling bomber marks the memorial to seven crew members of a Stirling bomber downed during the war. The Stirling Project maintains components and notes relating to this aircraft and is trying to ensure that what remains of it is not lost to history. Ideally they would like to obtain enough parts to recreate a Stirling for museum display, though this seems unlikely. Affiliated to Bomber Command Association. 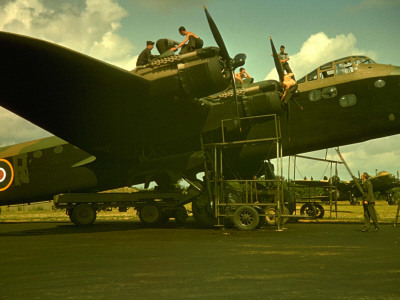 The Stirling Project is attempting to gather as many resources about the vanished bomber as possible, including parts which may aid in a recreation. Memories, photos and resources are available here. Only available in the UK and Europe, "Remember the Stirling" is the story of the Shorts Stirling bomber. The Product Description says it all: "Produced by Brian Harris, DFC, an ex-navigator on Stirlings, this DVD includes all the best available Stirling footage and exclusive interviews. Highlights include Churchill inspecting No.7 Squadron Stirling V-Victor, footage from Arnhem, a German amateur 8mm film of a 214 Squadron Stirling being shot down - and an interview with the rear gunner of that very aircraft." 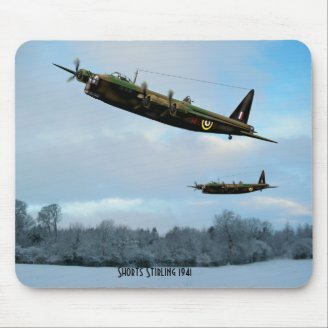 Amazon.co.uk - Buy Remember The Stirling at a low price; free delivery on qualified orders. See reviews & details on a wide selection of Blu-ray & DVDs, both new & used. Ron Minchin details what it took to fly the Stirling while towing gliders. The news release from the time about the Stirling, playing up its capabilities for propaganda purposes. You might also notice the drive to get more women into the factories. Wow it's a great lens,.Here are some video clips which charmed me so much. Thumbs up for a very detailed lens! @anonymous: Unfortunately, the data on the book is supplied by Amazon in a feed, and I can't edit it. There used to be a wikipedia module on the page, but wikipedia no longer support squidoo, so the module was withdrawn. My wifes parents lived next door to F/S D W Moffett who flew in a stirling bomber and became a member of the caterpiller club for jumping with a parachute and surviving. I dont know where he jumped but he was taken prisoner. I have the caterpiller badge he was awarded and am going to donate it to the museum at RAF Cosford in the near future. Hey, very nice lens! Very well put-together and professional looking. I found this lens from my similar lens on the B-25 Yankee Warrior. You should have a look at it and tell me what you think. Interestingly, my uncle Dennis Davison and crew were shot down on a Hamburg night raid in one of these BF387 MG-U on November 9-10 1942 on a Pathfinder mission. They were droppping coloured flares on the target so the bomber force could see where to bomb. Once the flares were burning, night turned into day so the German nightfighter planes had a easy view of who to shoot down. In addition to the nightfighters, the ground and the North sea were covered in very very effective search lights and flak guns so the bombers had to fly to Hamburg and then back through multiple walls of fire and lights. The lesser powered Stirlings couldn't fly high enough to even try to avoid the flak, so they were sittiing ducks having to fly through it. They had narrow wings so they they would fit in the WW1 hangars to save money and had low powered and unreliable engines. The strange wings actually allowed the pilot, in theory, to turn tighter that some of the german nightfighters. These planes couldn't even fly over the Alps so they had to fly around & through. The German pilots always started attacking the bottom lowest bobmers first and these were the Stirlings . Shortly after they came into service with 7 sqn, 67 of the 84 aircraft delivered had been shot down or destroyed .. scary. Going through this night after night they were incredibly brave. They were very likely to die and of course all were volunteers.. When Lady Rachel Workman MacRobert lost her sons during WWII, she donated funds for a Short Stirling bomber for what she called "A mother's immediate response". In the eighteenth century, Longitude positions could not be measured. Ships were being wrecked so the British Parliament passed an Act setting a prize for a solution.